The Lawudo Lama presents two life stories along with an extended introduction laying out their social and cultural context. It takes place in the Mount Everest region of Nepal, the home of the famous Sherpa guides, where the people practice Tibetan Buddhism and revere the local lamas and yogis. The stories are centered in Lawudo, a small village in the Khumbu region, and the central figure is the renowned Lawudo Lama. The first Lawudo Lama portrayed, Lama Kunzang Yeshe (1864-1946), was a yogi of the Nyingma lineage who spent much of his life meditating in a cave near Lawudo, and his life is reconstructed through meticulous research of written and oral histories. The second story is of Kunzang Yeshe's reincarnation, a monk of the Gelug lineage known as Lama Zopa Rinpoche, whose story is given in a first-person narrative. Lama Zopa is well known in the West as the author of several books and as the Spritual Director of the Foundation for the Preservation of the Mahayana Tradition (FPMT), which has more than 100 affiliate Buddhist centers worldwide. Lama Zopa Rinpoche travels and teaches extensively to large audiences and has thousands of students. The Lawudo Lama will appeal to travelers to Nepal, to Buddhist practitioners, and to scholars trying to understand the culture of the region. It is well documented, and is accompanied by more than 125 color and black and white photos, drawings, lineage charts, and maps. Jamyang Wangmo (Helly Pelaez Bozzi, formerly Jampa Chokyi) was born in Spain in 1945 and trained in law. After spending time in India and Nepal, she decided to take ordination as a Buddhist nun in 1972. A watercolor artist as well, she has spent much of the past few decades doing retreats in Dharamsala, India, and in the Solo Khumbu region of Nepal. "In some ways, the present volume is three books in one. First, it is an introduction to Sherpa culture and geography--a rare treat in itself. Second, it is a biography of Lama Kunzang Yeshe, the first Lawudo Lama, which takes into account both his outer and inner life. Third, it is an autobiography of Kunzang Yeshe's reincarnation (tulku) in the form of Thubten Zopa Rinpoche ("Lama Zopa"), who was born into a Sherpa family in Nepal and today is the spiritual director of the Foundation for the Preservation of the Mahayana Tradition (FPMT). [...] This volume is filled with touching and amazing stories of Tibetan and Nepalese yogis, who have dedicated their whole life to realizing enlightenment and serving the spiritual awakening of others. One gets a good sense of how great one's dedication to the Dharma must be to break through the karmic bonds of conventional life but also that even a lay practitioner can attain a high level of realization. Most importantly, this book offers one wonderful reassurance that great masters and teachings do still exist and are available to anyone who is serious about Dharma practice. " 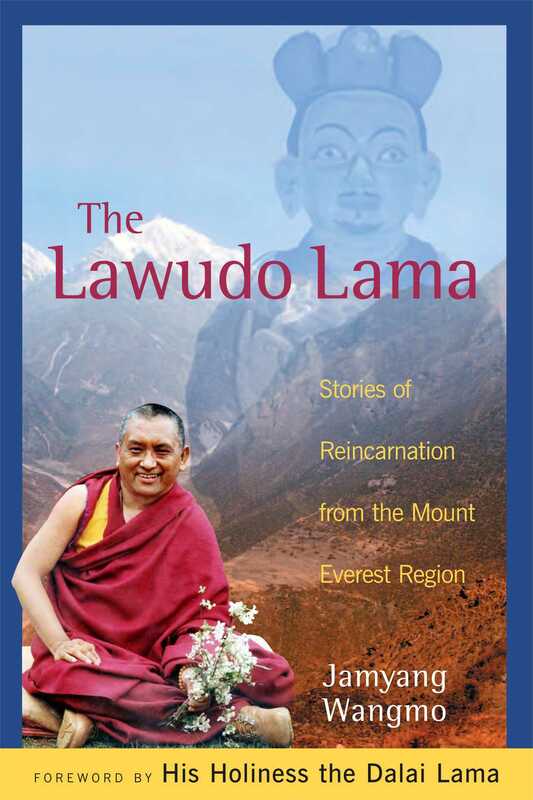 "The Lawudo Lama is an amazing tale recounting the lives of both the internationally known Lama Thupten Zopa Rinpoche and his previous incarnation, Lama Kunzang Yeshe. Unlike numerous other studies of Sherpa culture, religion, and history, The Lawudo Lama offers an account from within the tradition, as experienced by the main protagonists. Author Jamyang Wangmo, as one of Lama Zopa's early disciples--also among the few foreigners to have spent long stretches in solitary retreat at the cave hermitages of the Lawudo Lama--is uniquely qualified to write about the subject." "A fascinating, formidable read, offering in-depth, incredibly detailed information about Sherpa life in the Himalayas. The biographical stories of two famous lamas, Kunzang Yeshe (1865-1946) and the person who is said to be his reincarnation, Thubten Zopa Rinpoche also are engaging reading. Jamyang Wangmo's 434-page tome will prove a fascinating excursion for anyone interested in Tibetan Buddhism and Himalayan culture. Absorbing, descriptive narratives are accompanied by photos of the people mentioned in the stories. The book is laid out in distinct sections, allowing readers to use it as an easy reference. The six appendixes include indexes of persons, deities, places, and text. The cover art of The Lawudo Lama is beautiful and eye-catching. I suggest displaying it with other books about Eastern religions, and recommend it highly to customers interested in Buddhism, reincarnation, and Eastern philosophies." "I have no doubt that readers of this book will find here encouraging evidence that, even in this day and age, where there is real faith, good motivation, and a great deal of hard work, the Dharma will flourish and grow." "This fascinating book provides a unique--earthy yet mystical--insider's view of Himalayan life in general and of Sherpa life in particular. Will be very interesting to anyone who has travelled in the Himalayas and greatly inspiring to anyone who wishes to live a deeply spiritual life. Where else can one find a story in which the characters travel from life to life, continuing to teach, guide and support each other--it will stretch your mind and move your heart." "Religious biographies form a central part of Tibetan literature, and such accounts are now becoming important for Western Buddhists as well. The Lawudo Lama succeeds in combining the traditional style with a modern narrative and in illuminating the life stories through their context in the traditions of the Khumbu region of Nepal."